The jewel collection of Iran's former monarchy is kind of fascinating: it's huge in number of pieces and in size of individual stones, and it's filled with unique designs. Today's tiara is perhaps the single most valuable piece in the collection, and it's an excellent example of what the rest of the collection holds. The Noor-ol-Ain Tiara is all about its centerpiece: the Noor-ol-Ain diamond. Noor-ol-Ain can be translated as Eye of Light (you'll also see it spelled a variety of different ways, by the way). It is one of the largest pink diamonds in the world: around 60 carats in an oval shape. And like many notable historical diamonds, its history isn't exactly storybook reading: thought to have been mined at the Golconda mines in India, it was part of the spoils taken by the conqueror Nader Shah as payment for retreating from his invasion and subsequent plundering of Delhi a few years after he became the Shah of Iran in 1736. 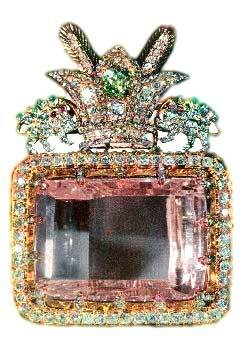 The Noor-ol-Ain may have originally been part of a larger diamond known as the Great Table Diamond; if true, its sister stone is the Darya-ye Noor diamond (Sea or Ocean of Light) which is a pink diamond around 180 carats also brought to Iran by Nader Shah and currently in the Iranian crown jewels. 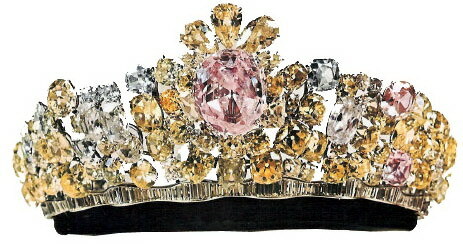 The Noor-ol-Ain was incorporated into a new tiara for the 1959 wedding of the Shah of Iran and Farah Diba. Designed by Harry Winston, the tiara includes 324 total stones, a combination of pink, yellow, and white diamonds set in platinum. Most of them are over 14 carats and with all that carat weight, it's even heavier than you'd guess - it's said to be in the neighborhood of 2 kilograms (more than 4 pounds)! It's an unusual tiara, but it's a fair representation of what the rest of the Iranian collection is like. Many of the tiaras are colored stones and many have unusual shapes or arrangements of stones. This is not a collection of boring tiaras, at least. This one is particularly interesting to me because it has that same Monet quality to it as Queen Alia's Cartier Tiara: up close, it's not what it seemed from far away. From far away, it looks like a white diamond tiara in a fairly traditional, albeit especially diamond-dense, design. It's only when you get up close that you realize the diamonds are colored and the setting is modern - the base isn't even the same old straight line. Farah wore the tiara throughout her years as Queen consort and then Empress of Iran and she will perhaps be the only person to ever wear the tiara. When the Shah and his family went into exile in 1979, Farah did not take big jewels with her; most of the tiaras and so forth belonged to the crown jewels, and so were not her property. Today, the Iranian crown jewels are on display at the National Treasury of Iran in the Central Bank in Tehran. What do you make of this unusual tiara?